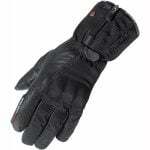 The perfect companion to the Alpinestars Andes touring suit, a technically advanced waterproof glove. Onto a winner: Finally we have it! The perfect companion to the bestselling Andes textile touring suit! We have no doubt that this Outdry premium glove will be just as popular. Technically advanced, the Andes gloves boast Outdry waterproofing, making it ideal for warm but wet weather. On longer rides, these gloves stand the test of time thanks to plenty of comfort features. A great looking glove all wrapped in great looking price!